All excuses things considered (the heat, stomach issues, mental block, family in town), I was overall impressed with this weeks running. I will be the first person to admit that I've been a slacker this summer with my training. I finally got in 4 runs with a total of 19 miles. Since my best friend was in town over the weekend, we decided to do our long run on Friday. 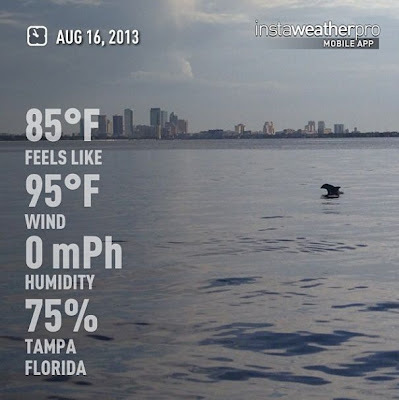 I took the day off work and we headed out for what was supposed to be an early morning Bayshore 8. We were about an hour behind, starting at 8:30am instead of 7:30am. The first 4 miles were nice, with cloud coverage. The last 4 miles were death which resulted in more walk breaks than I would have preferred. We did see a family of dolphins in the water and I caught an action shot of a baby dolphin playing in the water along the Tampa skyline. The following day, we participated in The Flavor Run at the Tampa Fairgrounds. This event was put on by John, the master mind behind the social running club, Running for Brews. I was very excited to take part of this event and support a local organization. I ran this race with Keri and my friend Rachel (runnerstales.com). At first, Keri was not too happy about the fact she was going to get dirty but ended up loving the experience. I was very impressed at the overall coordination of the event. 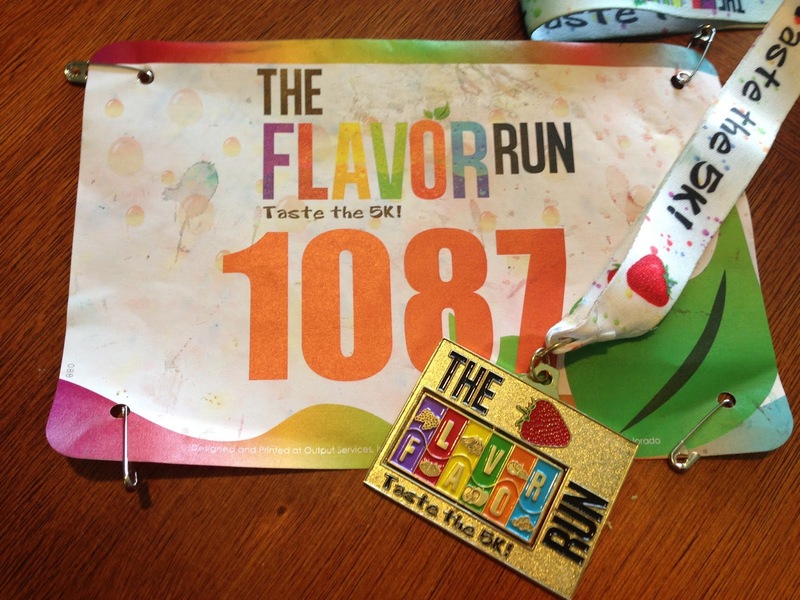 Flavor Run netted around 2,000 runners in the dead heat of the summer. The Flavor Run is similar to the other color runs out there with one exception - the powders thrown at you tasted like fruit. The event was organized very well. I've participated in a large number of national races, some of which didn't have the details this race had. Did I mention there was a medal!? At the end, we were handed a large plate of fruit from Whole Foods, perfect for those craving the flavors thrown at them. 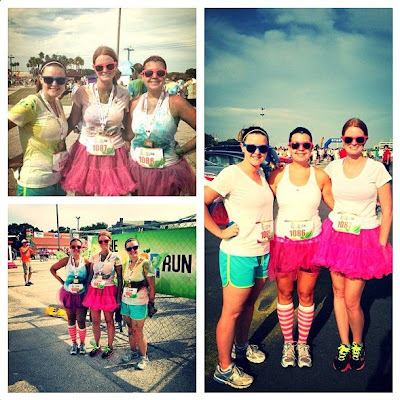 My favorite part of the race was running through the Enchanted Flavor Fairy Forrest. The three of us were supposed to be Flavor Fairies for the second part of the race but due to time constraints, we had to skip that. I did find a guy in a tutu which made for a great photo opp. The only thing I would change about this event is pushing it out a few months. I ran the Color Run in November and since the heat and humidity were vastly different, we did not sweat much during the race. Once liquid hits the color powder, it dyes your skin. When you are sweating and having color powder thrown at you, you have no choice but to get the powder wet. When Keri and I arrived home, we had to assist each other with scrubbing areas one another cannot reach. With the assistance of baking soda and losing a few layers of skin, we came out squeaky clean! Disclosure: I received my entry to the Flavor Run in exchange for promoting the event. As always, all opinions are my own. That looked like a lot of fun. I was concerned with my loathing of many of those flavors. NIce job getting your long run in!! If I am on bayshore saturday, maybe we can meet up! Hey!! I will be in New Orleans this weekend. I am not sure if we are in town for Labor Day or not and I will be in NY the following week. It's crazy. How is your training coming along? Oh wow! The flavor run sounds like a lot of fun (although I agree better suited for cooler weather)! I've never done a color run, but the flavor sounds like a fun twist! Also - way to go to get your long run in for the weekend! Always a nice thing to check off the list! The flavor run sounds pretty cool! I have never heard of it and I will have to watch out for it. Run For Your Lives Zombie 5K #Giveaway! Good Form Running - thanks runDisney!